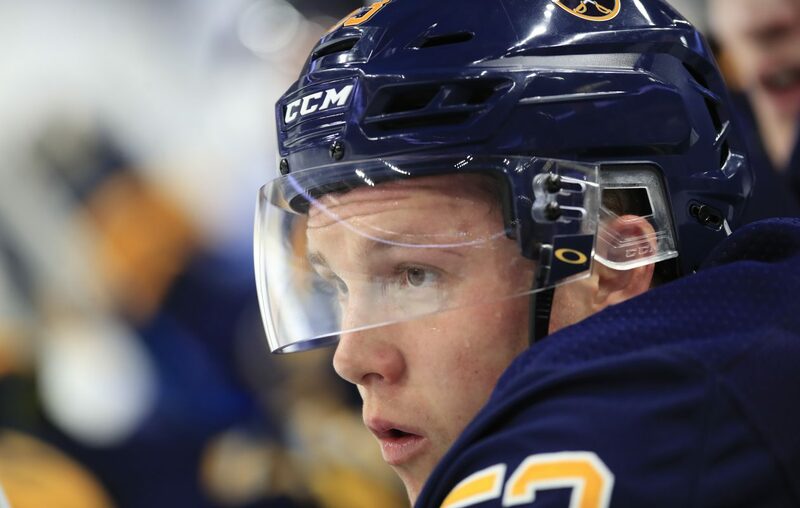 Travis Yost's Sabre Metrics: What should Sabres pay Jeff Skinner? Travis Yost has been involved in the world of hockey analytics for a decade and is part of TSN's Hockey Analytics team. Prior to joining TSN, Yost was a contributor at the Ottawa Citizen, the Sporting News and NHL Numbers, and he has been a consultant for an NHL franchise. He will be contributing breakdowns on the Buffalo Sabres for The Buffalo News this season. Follow Yost on Twitter:@travisyost. The 2018-19 regular season will close in just a few weeks, and for the Buffalo Sabres, it again means an early transition into the offseason. Stop me if you have heard this one before, but it’s a critical summer for this Sabres front office. Pressure is mounting to deliver a serious playoff contender, and while this season's Sabres were more competitive, they were also fatally flawed. And so attention will turn to General Manager Jason Botterill to refine this roster and bring in personnel – especially when it comes to their skating depth – that can help add wins to the standings. The first order of business, though, is probably the most critical, and that’s what to do with upcoming free agent Jeff Skinner. The 26-year old was a blessing for the Sabres and arguably their most valuable player. The Sabres didn’t give up a fortune to bring Skinner in, but there was always the qualifier that this trade would largely hinge on two components: Skinner having success in Buffalo’s system, which has materialized; and Buffalo being able to extend him on a reasonable contract. Skinner has complicated the second matter. He’s amassed 37 goals and 22 assists (59 points) in 72 games, and has a strong shot to be a 40-plus goal-scorer. Considering only four players have done that season to date (that list includes Alexander Ovechkin, Leon Draisaitl, Patrick Kane and John Tavares), and knowing how strongly offensive counting numbers tend to drive future contracts, it’s going to put a premium on his price tag. To that end, I thought it would be interesting to see how similar attackers around the league have been compensated in relation to a potential Skinner deal. This, of course, operates under the assumption that Buffalo will make an aggressive offer to Skinner at some point in the future. We might not understand the full scope of these negotiations, but we can infer that a serious contract offer from Buffalo would interest Skinner. 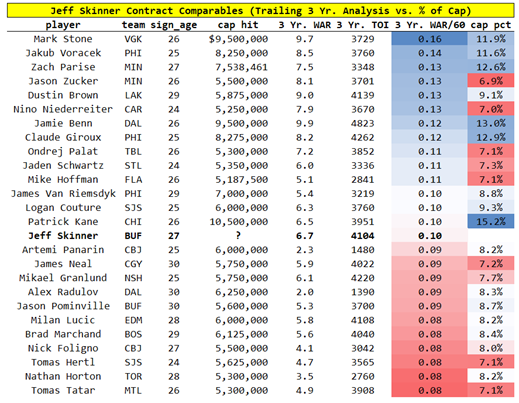 After applying necessary restriction criteria on age and prior contract status, I would argue there are 25 players who are solid comparables for Skinner. The focus should be on the two far right columns, where we see each player’s trailing WAR per-60 minutes of play over the prior three seasons, and the associated cap hit of their next contract. There are a few players you could probably eliminate to further refine the sample (guys such as Jason Zucker and Mike Hoffman on the lower end, and guys such as Patrick Kane and Jamie Benn on the higher end), but that’s a bit more nitpicky than anything else. The 25 comparables took down an average cap hit at a tick more than 9 percent, with a median – to act as a bit of a better controller for outliers – of 8.5 percent. What does that mean for the Sabres? Applying that 8.5 to 9.0 percent rule against an $86 million cap ceiling expected for the 2019-20 season, we would expect Skinner’s contract to come in between $7.1 million and $7.6 million average annual value. That doesn't mean he would accept those terms with market forces at play. The figure doesn’t seem particularly daunting for a guy capable of scoring 40 goals in a season, but it’s worth noting that Skinner has a bit of an unfavorable injury history and turns 27 come May. Knowing how the NHL’s aging curve works, the signing team – be it Buffalo, which can offer eight years as opposed to other teams that can offer seven – will need to weigh the tremendous value Skinner brings today against the depreciated value on the back half of the contract, assuming Skinner tries to max out the term of this contract. Can Buffalo fit in this type of contract? Certainly. And they probably have more pressure to get things done (and perhaps marginally overpay in the process) for a multitude of on-ice and off-ice reasons. But moving the cap hit percentage decisively higher than 9 percent would start to appear as a bit of an outlier for a player of his production level, and the Sabres should be cognizant of such.